Honda of Gainesville is happy to offer the most advanced and stylish new vehicles from Honda. We have a variety of new Honda models from the Honda Civic to the Honda Ridgeline. Our inventory is always being replenished and enhanced with sparkling new vehicles from Honda. To check out our current inventory of new models, visit the Inventory Page on our website now. Come into our Honda dealership in Gainesville today to check out our extensive inventory of brand-new Honda vehicles. Set an appointment for a test drive through our website now. In addition to the new Honda vehicles that we have at our dealership in Gainesville, we also have Certified Pre-Owned Vehicles from Honda and Used Models from many different major manufacturers. Just like our new models, our CPO and used selection can be found here on our website. Find the Certified Pre-Owned or used vehicle that you want in just a few seconds by searching our online inventory. 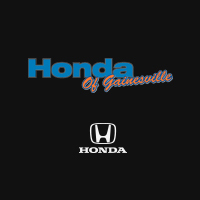 If you’re looking for used cars in Gainesville, look no further than Honda of Gainesville. Our used car dealership certifies our CPO inventory with a multi-point inspection to ensure the quality of our Honda vehicles! Test-drive any Certified Pre-Owned or used vehicle that catches your eye today. When you’ve found the vehicle you want, our Finance Center will help you obtain it. We can help you get a car lease or loan at a rate that works for you. Our finance team is here to help you with every step of the car buying process, our website even offers a financing Pre-Approval Application. Get the ball rolling on the finance process by filling out the online financing pre-approval application on our website today. When you get your results, come in and meet with the staff at our Honda finance center. We’ll work tirelessly to finalize the financing you need to get the Honda model of your dreams. Our Honda of Gainesville car dealership doesn’t just offer an impressive selection of vehicles. We also have a factory-authorized service center on site. Whether you have a Honda vehicle or a model from another make, we can take care of any maintenance service or auto repair needs you may have. Our Service Center offers Special Coupons and Deals well to help you get the auto service you need. Bring your vehicle into the service center at our Gainesville car dealership today to get quality auto repair and maintenance work completed. Set a Service Appointment through our website today. Drivers in Jacksonville, Ocala, and elsewhere in the Gainesville, FL area are more than welcome to visit the Honda of Gainesville car dealership today. Whether you’re looking for a brand-new Honda vehicle or a pre-owned vehicle from another major manufacturer, we have it in stock. Our reputable finance center can help you drive away in the vehicle you want. We also have a service center at our dealership in Gainesville to take care of all of your auto repair and maintenance needs. Honda of Gainesville sets itself apart from other dealerships in Gainesville with our Lifetime Warranty. Every pre-owned or new vehicle that you purchase from us comes with an unlimited-time, unlimited-mile warranty at no additional cost. The warranty covers some of the most vital systems in the car. See the details of this Lifetime Warranty yourself at our Honda dealership in Gainesville, FL. Stop by our Honda dealership in Gainesville to benefit today.